If you don't think I am a princess, you're a 100% right. I am a queen. 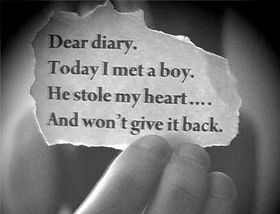 I'm really good at keeping secrets because five minutes later I forget what you told me because I don't care. A girl may not believe that she's beautiful, But that doesn't mean she doesn't like hearing you to tell her she is. 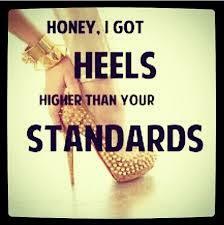 Honey I got heels higher than your standards. There are only three things in life a girl needs: Love to make her week. Alcohol to make her strong. Best friends when both make her hit the floor. yeah i guess and thanks. 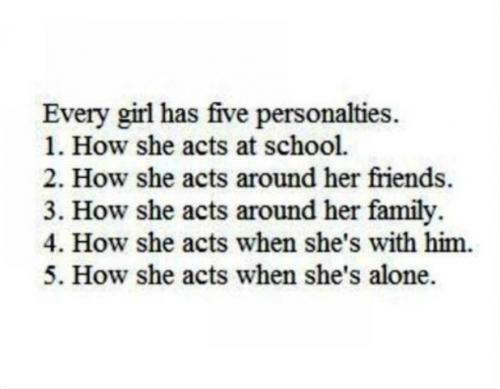 Every girl has five personalties. 1.How she acts at school. 2.How she acts around her friends. 3. How she acts around family. 4. How she acts when she is with him. 5.How she acts when she's alone. I want to be the girl you fall for when everybody else is falling for you. If a guy cant handle you in a sweat pants,he sure as hell doesnt deserve you in a wedding dress.